An interesting thing has happened in collecting over the last year as a result of Disney’s purchase of Star Wars. For years Hasbro reigned unchallenged in the Star Wars action figure marketplace. 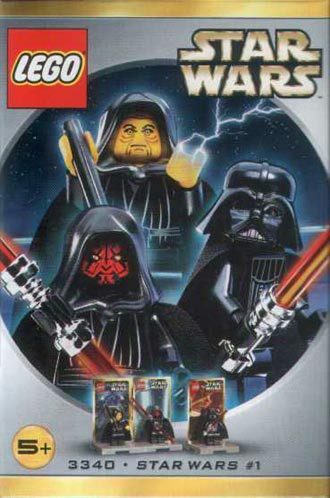 When Lego tried to put out mini-figure sets back in 2000, Hasbro objected, claiming its exclusive license for Star Wars action figures. That’s why Lego includes at least some buildable aspect to its current battlepacks despite substantial demand for Star Wars mini-figures. 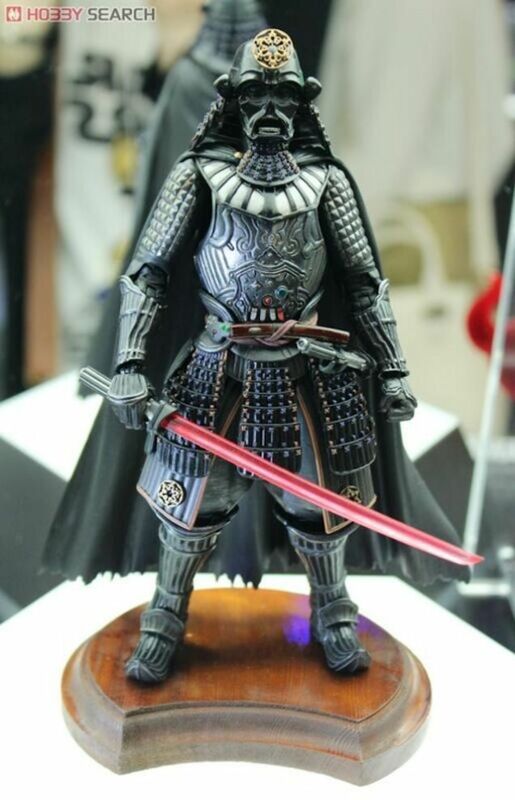 According to io9, this is described as the “Star Wars Movie Realization Samurai Taisho Darth Vader”. It stands 6″ tall and looks to be the beginning of a line that will include Stormtroopers. This line is a must get for me and is already available for pre-order from a few e-tailers. 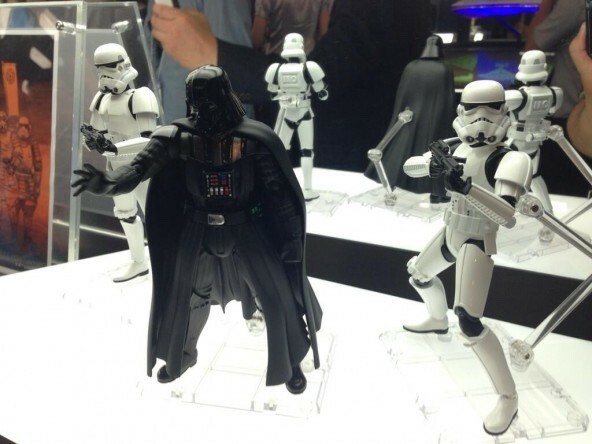 Also from Bandai will be a more conventional Star Wars line starting (again) with Vader and Stormtroopers. The Fwoosh has the details, but the S.H. Figuarts line is noted for increased articulation on its figures. The scale of this figure is unclear but it seems to be close to 6″. I’m not sure why Vader seems to have no neck and is the same height as the Stormtroopers. Okay, this just looks crazy. 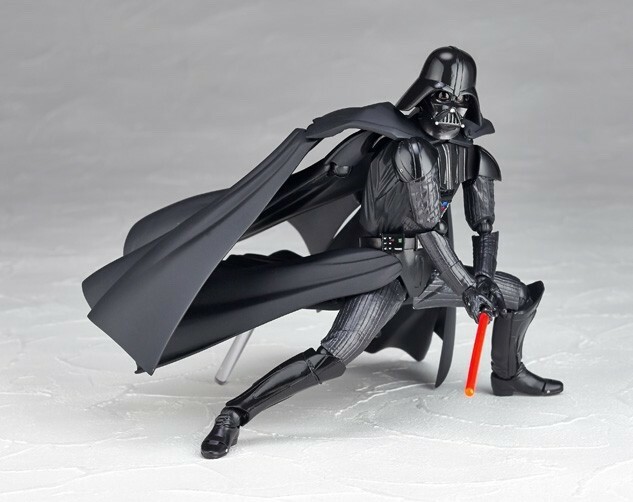 Kaiyodo is doing Vader in their Revoltech style which features interchangeable hands and a super articulated CAPE. Head over to Toyark for some additional photos. It’s not my thing, but I always welcome licensees pushing the boundaries and going beyond traditional representations. How many different screen accurate versions of Vader can we possibly have? 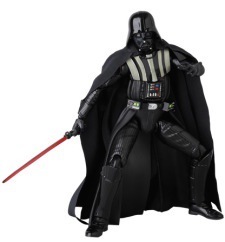 According to The Fwoosh, this figure stands 6.75″ tall, so it’s comparable to Hasbro’s Black Series figure. It features a removable hand to reenact ROTJ. Toyark has close ups of the actual figure. At first blush it looks like they did a better job than Hasbro of mixing the soft goods with the plastic cloak but the figure seems a little stiff. But apparently once you get a few drinks in him he’ll break out the dance moves. 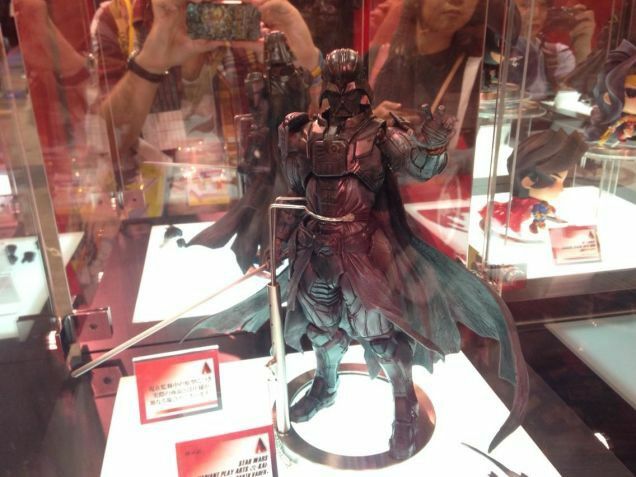 Last but not least, Square Enix has a Vader for its Variant Play Arts Kai line, which is a line of hyper stylized toys. This Vader seems inspired by the McQuarrie concepts as evidenced by the helmet design and the chest panel. As this is the one figure we’ve only seen as a prototype, it’s hard to make a judgment. At first I was kind of down on this figure, but the more I look at it and think about the potential for other characters in this line, I think it could be really cool. I’d love to see a stylized Maul, Kenobi or Luke in this line. Head over to io9 for more information. For those who haven’t had any luck finding a Proto-Fett at Walgreens, there’s a new hope! Walgreens.com recently updated their site with a store search feature where you can find local stores with Wave 5 in stock. Keep in mind that although the search seems to be Proto-Fett specific, it is actually for any of the Wave 5. Collectors have been having mixed success with this so I strongly suggest calling the stores to confirm. Use the instructions in my previous post for the best results. For folks having a tough time finding Proto Boba – We are sending a straight case of 8 to over 5,000 stores starting in November. Unlucky hunters should hang tight as well. As highlighted by Adam Pawlus of Galactic Hunter, a Walgreens buyer recently tweeted that they will be shipping solid cases of Proto-Fett to 5,000 Walgreens stores across the country. That’s 40,000 Proto-Fetts hitting stores in November! So have patience my little friends! 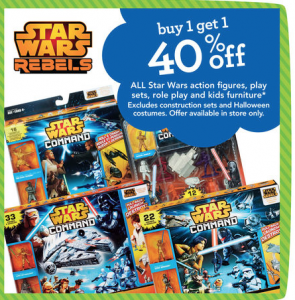 Finally, for those of you seeking to troop build or catch up on your collections, Toys “R” Us is having a buy 1, get 1 40% off sale this week. Thanks to Yakface for the heads up.